Discussion in 'Herp Help' started by Sarah Jane, Aug 25, 2018. Okay, so I have a 3 year old jungle python. He’s starting to outgrow his cage so I’m getting him a new big enclosure tomorrow. He’s currently in this (I actually don’t remember the specs too well). It just feels like it’s getting too small for him. So not only do I want extra space for him since he is growing, I also want it to be environmentally enriching for him. Obviously not the same way you’d do that for a dog or a cat, but give him a few branches to stretch out on and a choice of 2 or 3 hides. He’s generally a really bloody stoic snake. Nothing really freaks him out. Didn’t even bite when he was sexed and damn that’s gotta be uncomfortable. Basically, first and foremost, I’m asking what are your thoughts on what I’m trying to do here? I want to do the best by my animals and I find I need reassurance sometimes and sort of confirmation that this is a good thing to do. Secondly, if he does happen to get stressed, are there any other signs that show that, apart from resisting food? 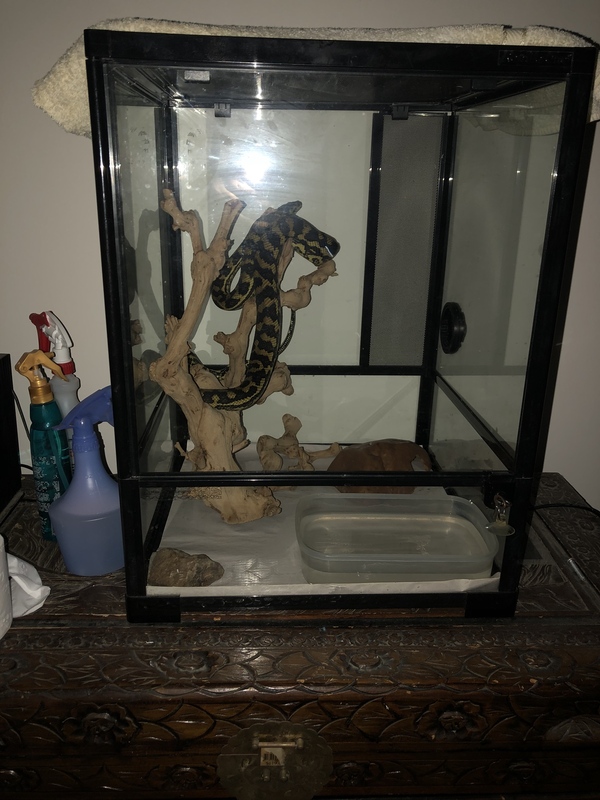 If I put him back in his old enclosure, will he settle down again? How can I ease the transition for him? On a complete other note - what substrate would you recommend for an enclosure like that? I do feed him in his viv so I don’t like the idea of him easily ingesting substrate. Re substrate; I use the fine Kritters crumble for my MD; have never had a problem with the feeding. I use a large tile in the bottom of the enclosure as a feeding spot or occasionally put the rat on one of the shelves. Thanks! So aspen not a good idea? I just built a new enclosure for my sons Coastal and he has settled in wonderfully. We use recycled cat litter as substrate and it’s super easy for snakes because it’s easy to see when they’ve pooped and a spot clean is all it needs. 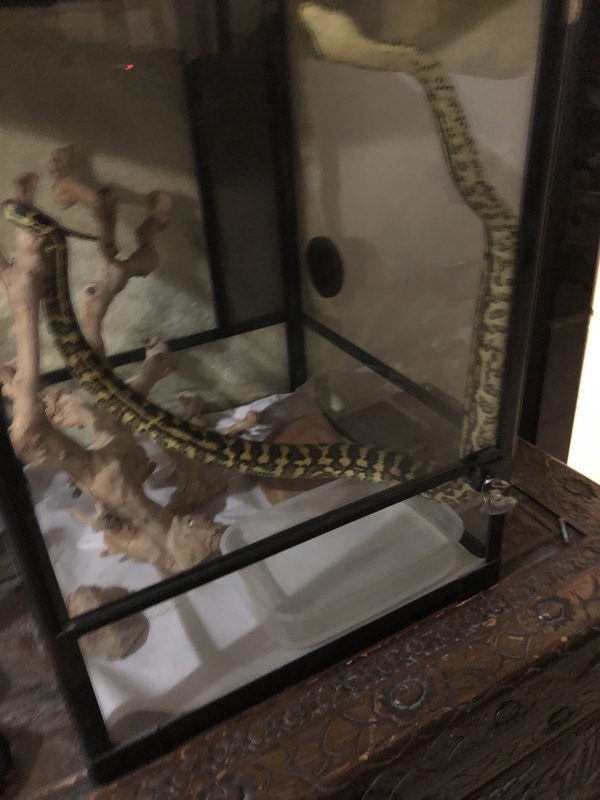 In regards to his temperament changing, just leave him be for a week once he’s in there so he knows it’s safe and then feed him once before handling. That’s all we did and it’s worked a treat. Horribly lit picture to show how comfortable he is basking almost directly under the light, out in the open. Aspen is fantastic, just so damn expensive. Thanks! I’ll let my son know you think so. And maybe get some better (not under the spotlight pictures) soon!